The need to produce satisfactory chroma keys sometimes seems like the holy grail of many shooters. As a result there are several excellent pieces of keying software plug-ins now available. New to the block is the Vector Key plug ins for Mac OS-X and Final Cut Pro, Final Cut Express, Quicktime and Adobe Premier from Oak Street Software. Created by Douglas Tolzman of Oak Street the Vector package consists of 3 individual plug-ins, the Vkey 1 Filter, Vkey2 Filter and the Green Key Filter which are easily installed by placing them in the Quicktime folder found in the Macintosh HD's library. Application of the any of the filters is just as easy. 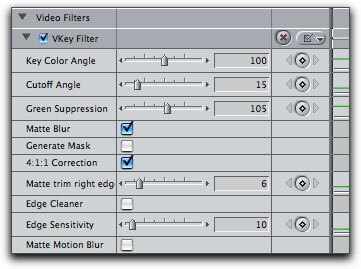 Depending on the quality of the footage you are using, these filters will all do a fairly equal and outstanding job of successfully keying your footage. 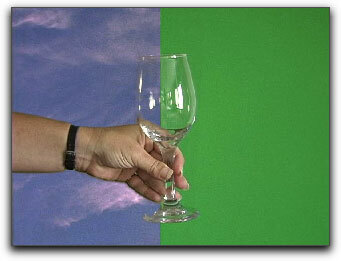 I found that the basic Green Key filter was somewhat equitable to that of the Final Cut Pros chroma filter. It did a commendable job, and was simple to apply and set. 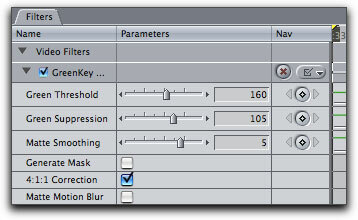 The Vkey 1 filter provides additional parameters for you to adjust. 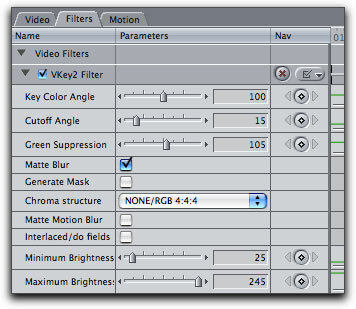 Edge smoothing can help with those tough areas and this filter simply takes things a step or two further should your use of the Green Key filter not provide you with the final results you were looking for. Using the Vkeyer 1 filter provided me with smoother lines though I had some trouble removing the green from around her hair. The Version 2 does away with edge trimming effectively evaluating the video and interpolating the alpha between chroma samples. There are controls for both minimum and maximum luminance, which allow you to protect dark and bright areas from keying while widening the vector range or tolerance. This new version of the Vector Key, evolving from version one, now supports PAL and HDV chroma structures as well. While the standard Green Key filter works just fine, especially when the green background is on the dark side, the new vector keyer is completely different and it can achieve great results where the other two might fail. The chroma-key solution has special features built in to compensate for the low color resolution of 4:1:1 video, and it sports the simplest green suppression I have seen. Before and After split image with the Vkey filter. In real world application it appears that the Vkey version one filter is the keyer to use. Should you not get the results you are looking for, or if you are using PAL video the new Version 2 vector keyer will be your saving grace as it can pretty much do it all. It is easy then to ask as to why bother with the V1 or Green Key filters at all, reasoning that the Vkey 2 filter will handle everything. Fair enough question; lighting and subjects are always variable and for that we all need to try different approaches and tools. While the Green Key and Vkey1 filter will handle most chroma keying applications just fine, it is beneficial that the Vkey 2 filter is there as a backup should you run into problems. The Vkey 2 filter seems to do it all. There is apparently a great word of mouth going about for Oak Street Software's V Key Chroma software. That is how I first heard about them. I found their service and response to questions or concerns to be superb. Be aware that the development of these chroma plug-ins have been on going. I myself received 3 different upgraded versions within the space of a few weeks. This demonstrates Oak Street's ongoing commitment to providing an excellent product. All upgrades will be free to any purchaser. 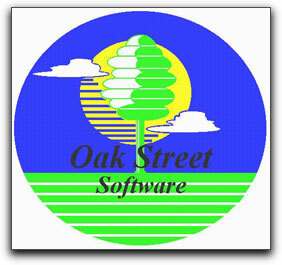 You will also find the Oak Street website to be of special help with their online tutorials, samples and a free download demo for your evaluation. At such a low cost, you have everything to gain and almost nothing to lose.